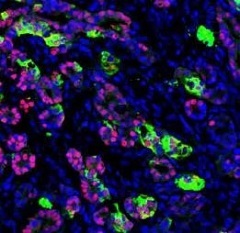 SAN FRANCISCO, CA—Scientists at the Gladstone Institutes and the University of California, San Francisco (UCSF) have successfully converted human skin cells into fully-functional pancreatic cells. The new cells produced insulin in response to changes in glucose levels, and, when transplanted into mice, the cells protected the animals from developing diabetes in a mouse model of the disease. Holger Russ, PhD, was a co-first author on the paper from UCSF. Other Gladstone investigators include Xiajing Wang, Mingliang Zhang, Tianhua Ma, Tao Xu, and Shibing Tang. Funding was provided by the Roddenberry Foundation, National Institutes of Health, National Heart, Lung, and Blood Institute, National Eye Institute, National Institute of Child Health and Human Development, National Institute of Mental Health, California Institute of Regenerative Medicine, Prostate Cancer Foundation, and the Leona M. & Harry B. Helmsley Charitable Trust.